Here is a pic I found on my desktop from a while ago.. 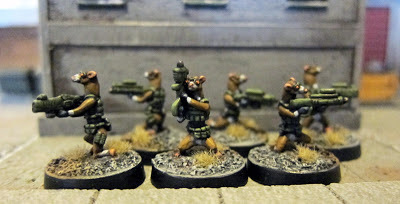 It's the close-combat specialist Lhurgg pack from Khurasan miniatures. I stuck with the same scheme as my tribesmen, but added war paint when I was done in order to help pick them out a bit. I painted the Huk huks (electric swords) at least three times trying to make them look like heat-blades. I gave up in the end and just painted them bright orange with a strong yellow highlight on the edges. These guys are a little larger than the tribesmen, but I think this is a good thing... Evoking bigger tougher berzerker types. It's nice to have another troop type to round out these nudist aliens as an enemy force. It's not often I get to scoop the interwebs... But Jon from Khurasan Miniatures has allowed me to post this pic of some space Mustelids (Ferrets, Otters and weasels on earth) that he will be releasing in the future. I imagine the near future, as they are lovely metal castings he sent along with.. Well, that's a secret still. I actually painted these guys last November, but have been keeping the lid on them as usual with pre-release minis. They are especially cool for me, as a long time ferret owner. My last ferret died in 2010, after 10 long years of faithful companionship and travelling around the world. It's been strange not having a furry troublemaker around the house since then, but I'm very happy to report that I adopted a new baby in December, who is keeping me very busy with training and housebreaking. 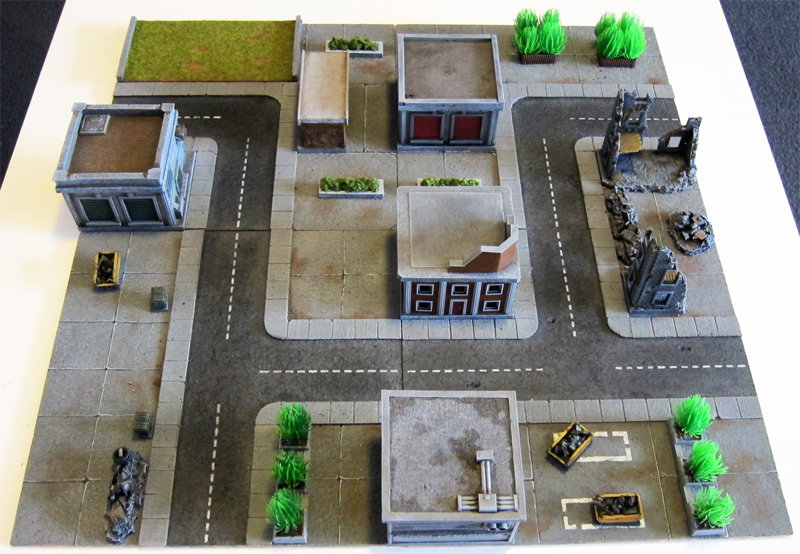 Since it's been so long since my last post, here are some photos of my latest terrain jaunt... A modular Urban board! 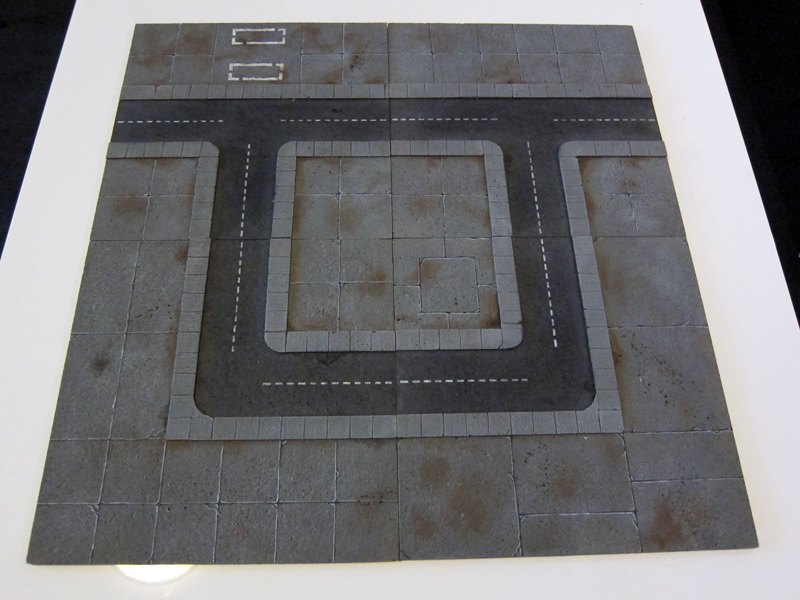 They were inspired a little by the X-com video games as well, with their gridded yet attractive layouts. The build was very easy. 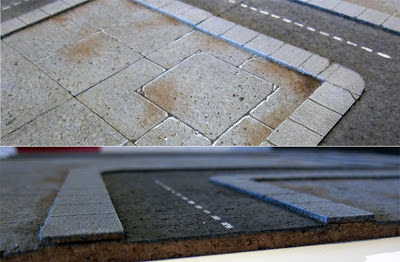 I cut strips of thin cork for the pavements and glued them on with PVA, then cut cracks into them. Everything else you see is just painted-on detail and drybrushing over a base of tinted textured paint from the hardware store ($10 for 250ml). I used craft paints for the main areas, and a little bit of Citadel washes to help break up the greyness. 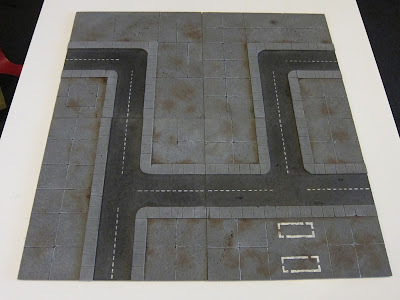 When I first painted them, I left the non-road areas drybrushed grey.. But they looked too dull. I remedied this by pencilling in some simple pavement cracks, then painting them in with a black ink/water mix. This dried very quickly, then I highlighted the dark line with thinned Citadel Astronomicon grey. 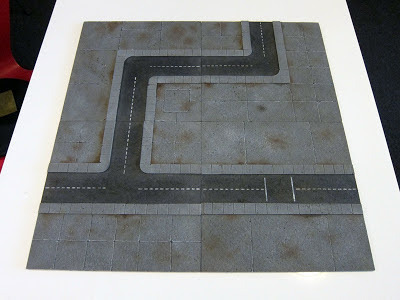 The road paint was done by masking off the shapes and stippling white paint on. My favorite part of this project is the variety of layouts that can be achieved by rotating each 12" square. I made 2 elbows, two 't' shapes and one straight. I was planning more, but I don't think I'll need them... 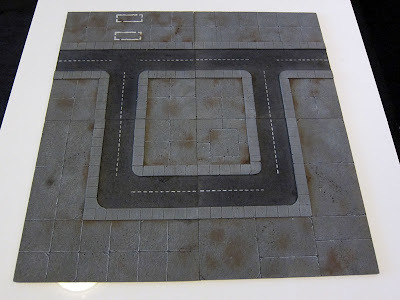 Although I might make a parkland or pure concrete tile with the spare one day.